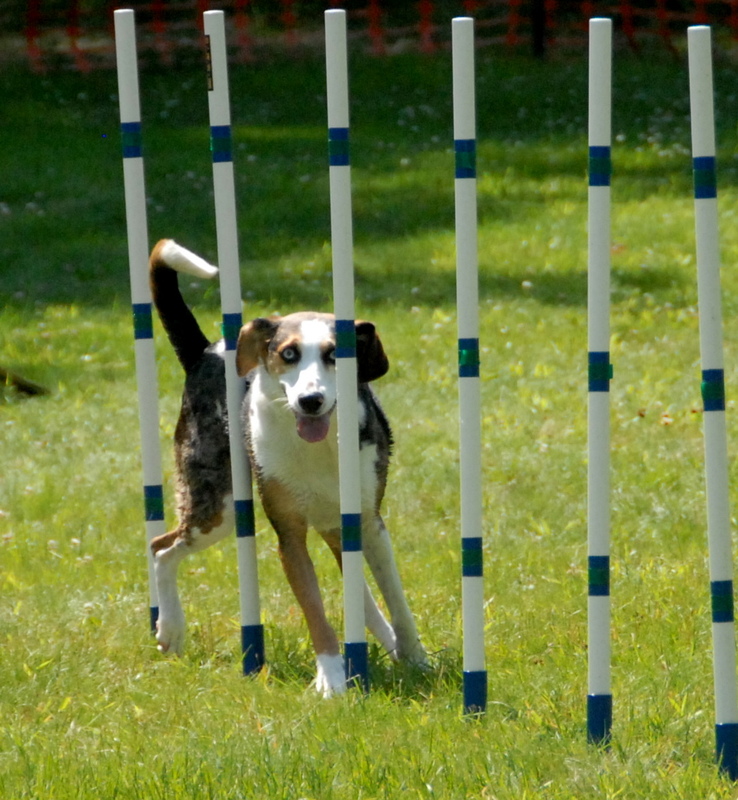 In the past year I think Scraps has learned to manage the weave poles in competition but that is about it. He isn’t fast at them, can only enter on one side for success and the poles aren’t a fatal flaw in a run, but he still only manages them and doesn’t attack the obstacle. We have heard about people’s success in the 2×2 weave pole technique to teach the dog how to do weaves well. Since St. Huberts and Jackie were teaching this technique in the form of a 2 hour seminar, Kathy decided to take Scraps and see what it is all about. I happened to be at the David Nelson Band concert in Whippany and couldn’t attend the class. Kathy came home excited about the potential of teaching Scraps the weaves this way and now that Rags is also beginning to learn agility, it will probably be worth the $150 investment into a 3 pair set of 2×2 weave poles. That’s a lot of numbers of 6 poles. 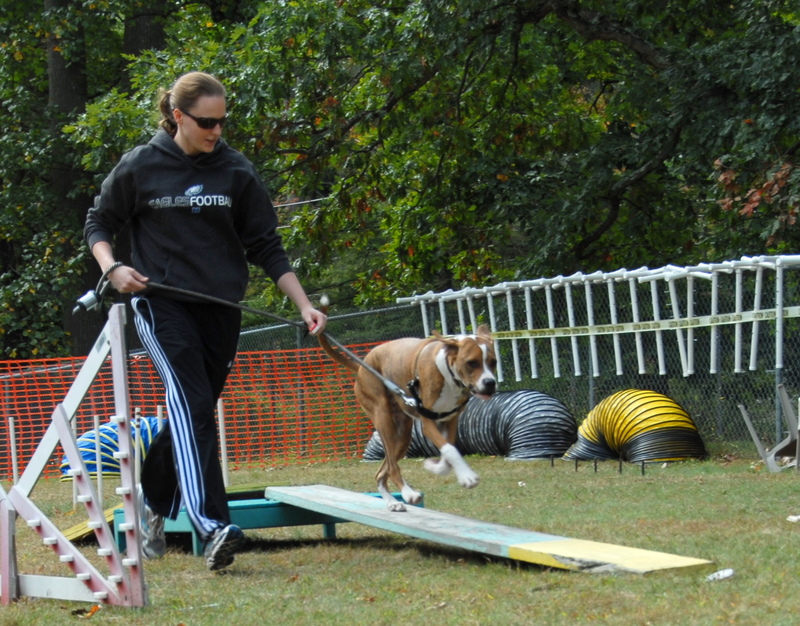 Hopefully you will see our success in more Q’s in the agility ring. Week 3 featured more of the same methodical introduction to the agility equipment we will be encountering during a standard run. Most of the work we did this week involved targets and I’m glad that Rags and I had an excellent practice at home on Thursday night where I think the target concept really hit her and the nose on the target was the best thing she did during week 3. We started with the ladder practice with a target to get the dogs acquainted with their rear legs. Rags did well in this. We then did some plank on the ground work and Rags had some difficulty getting the hang of it but the target concept helped her out in the end, literally. The plank turned into introduction to the ramped dog walk with a target at the end. We continued running through the channeled weave poles for the 2nd week in a row and ended the class on an introduction to the chute without the actual fabric chute. Rags did both the weave poles (channeled apart) and the chute without a problem. As far as Rags behavior and focus, she was good. She does get distracted by smells in the grass and I am still not sure she will eventually run with me when I don’t have treats on me, but time and practice will tell us if she is destined to compete in the future or not. 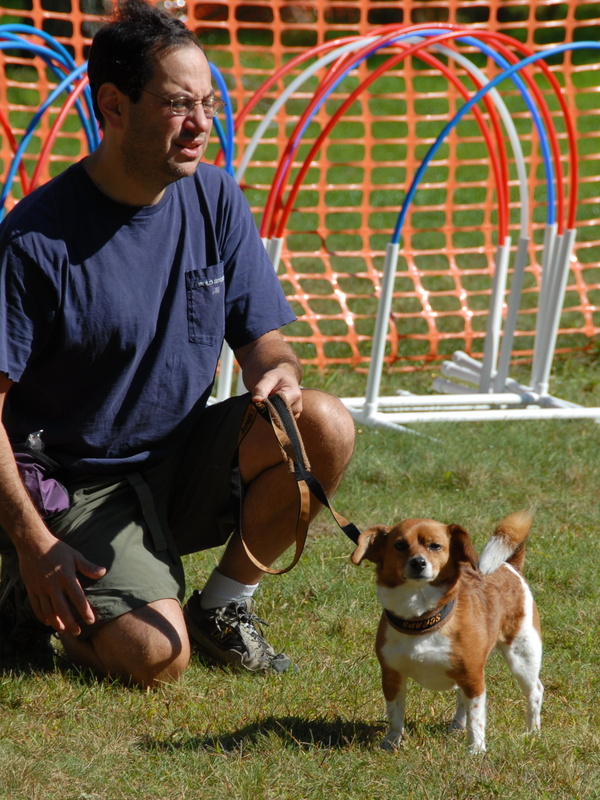 Next week Rags and I will be alone for Class as Scraps and Kathy will be competing over on the other side of town at the CPE agility trial at Lewis Morris Park. There probably won’t be any footage of week 4 so soak up the fine footage Kathy shot of this week. 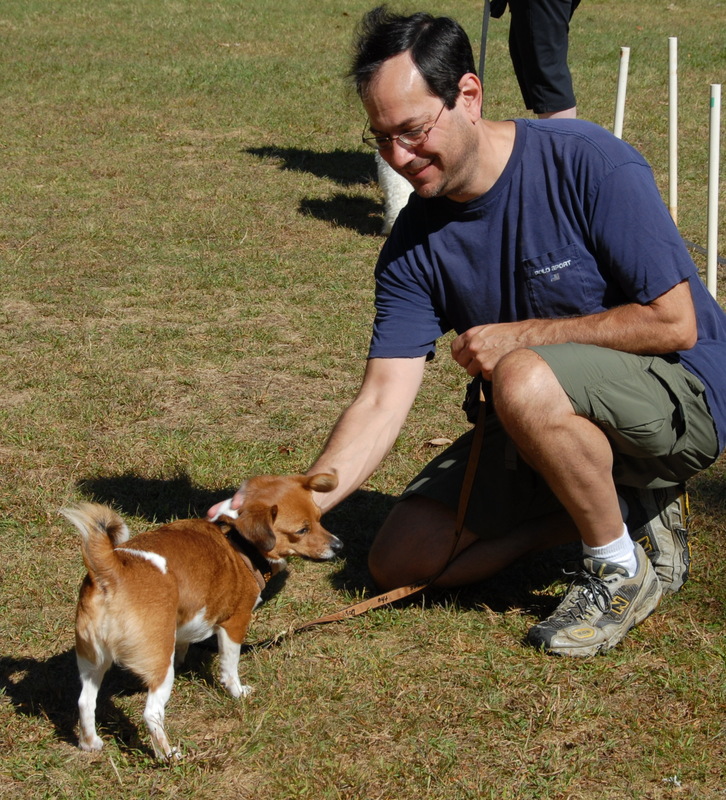 Unlike week 1, the second week of Rags’ agility class featured beautiful weather. Once again, Rags behaved really well during the class and didn’t bark at or bother anything around her. Additionally, she performed really well in her homework as well as the three or four new things she tried. Initially in class, we practiced luring with each hand separated and transitioned between each hand vis-a-vis a front cross. Rags did this well with the added space inside the practice ring giving her room to run which she doesn’t get when she practices at home in the basement. We did a target at the end of walking over poles and through a ladder and she did okay with the target but she knows the concept. While we didn’t practice any tunnel, which we learned the first week, we did get introduced to 3 new obstacles including the tire, the plank and the weave poles. The tire was introduced by having it as low as possible. Since Rags has experienced a tire she did really well at it. The weave poles was introduced by spreading them and letting the dog run through the subsequent channel. Rags did this very well. Once I figured that I need to have better body positioning and lead Rags with my hand at a very low level, we were able to complete most of our tasks quite easilly. Finally, we were introduced to the plank by walking her on a plank on the ground. This she did from both sides very well. Tom, our teacher, gave us lots of tips on how to create much of our own agility equipment. He described the creation of weave poles using 3/4″ PVC pipe with an end cap that you drill a hole in to insert a very long spike which you keep in the end cap by placing a nickel over the head of the spike and then putting the pole inside the end cap securing the nickel and the spike in a javelin type of pole that can be spiked into the ground. Buy 6 of these setups and you have a cheap and portable set of weave poles. It was a good class, I am surprised how quickly we get introduced to all the equipment and get us going on learning it. It is nice the Rags is already being introduced to the weave poles. 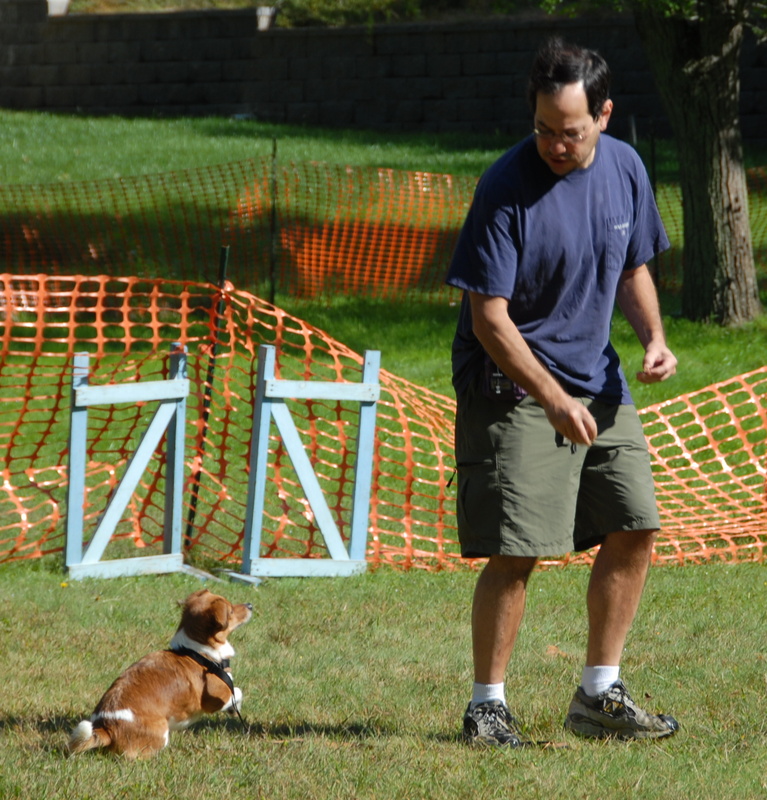 It’s now time to practice and get ready for week 3 of beginners agility class. Rags the Dog tried her first agility practice trial a couple of weeks ago and the positive experienced convinced us to begin her agility training. 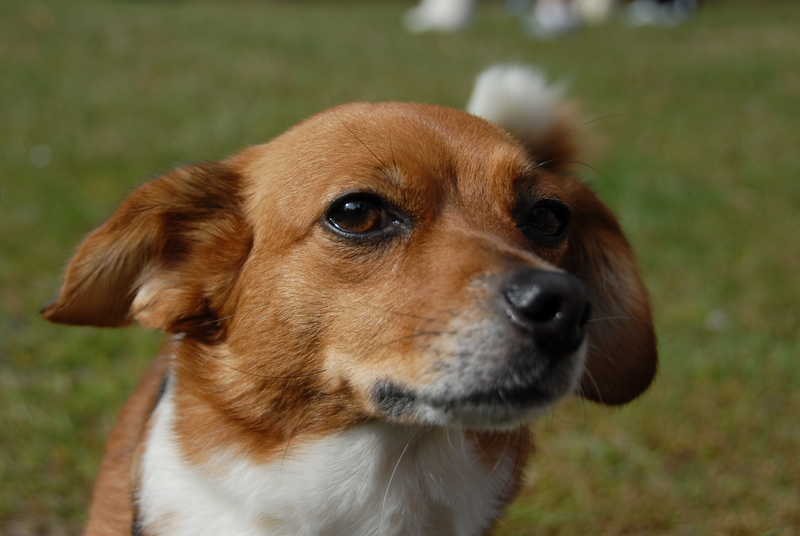 We signed her up for an 8-week beginners agility class at St. Huberts at the outdoor training field in Chatham where we run many of our trials. This will be good practice for getting her used to this field with all of it’s distractions. The class runs for 8 consecutive weeks starting this September 12 and continues through Halloween. Today also represents the opening the the 2010 football season and the Giants’ new stadium. I guess I am going to get into the habit of waking up on Sunday morning and taking Rags to agility class followed by the Morristown Farmer’s Market into a Giants game. Sounds like a fun fall of 2010. Go big blue and go little Rags. It looked like week 1 wasn’t going to happen due to the weather. We were surprised they didn’t call the class but 7 dogs showed up so this is a dedicated bunch. We almost bailed due to the weather. Tom, the agility teacher made the right decision to have the class because it only drizzled. The most important thing is that Rags behaved in class really well. All 7 dogs were well trained and in control. Rags was not a distraction what-so-ever, for that I was proud of her. She has a bit of an advantage at this level in that she has used and experienced jumps and tunnels in her life. She was very distracted while performing by the ground so I will have to work on her focus to me, that will be my digest challenge with her. As far as Rags goes she had a good week, a victory in my book. Now let’s see about the Giants can do the same. 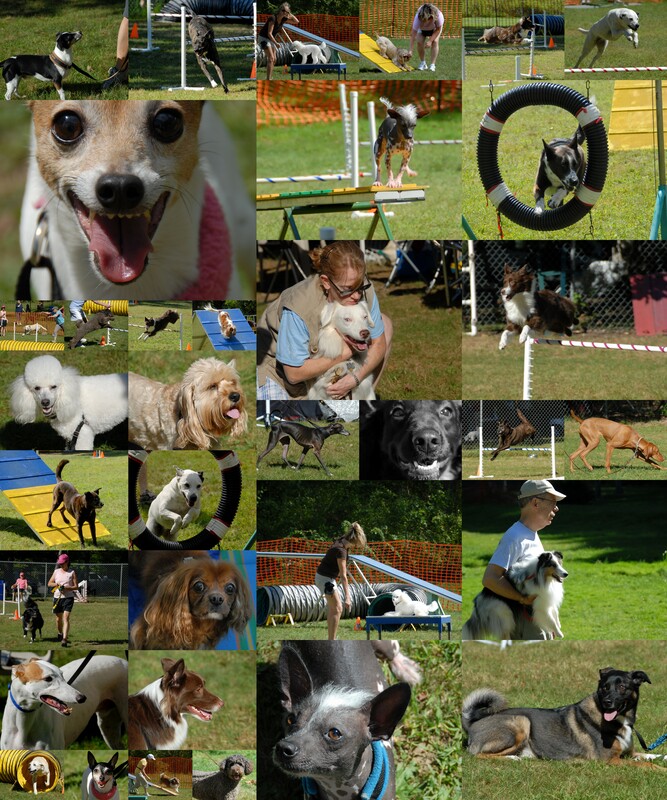 On this picture perfect first Saturday of September St. Huberts was sponsoring agility fun runs as a fund raiser as well as a way to get in some trial practice and experience. 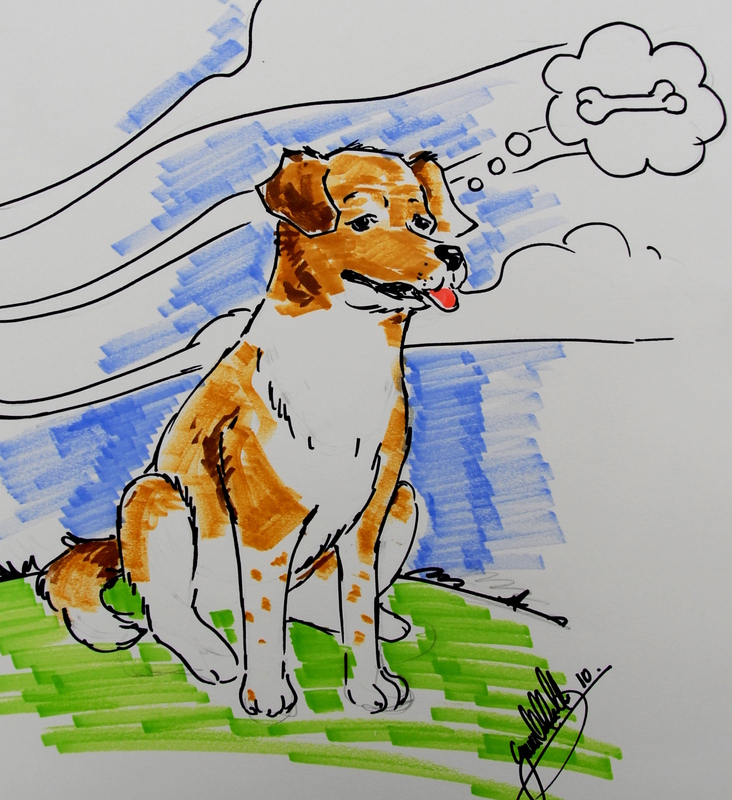 This gave many novice/beginner dogs and handlers an opportunity to see what competing in an agility trial is like. What it did for us is to give Rags the Dog a chance to hang with us during a trial as well as run in her very first agility run. Once again, this was not a sanctioned event, only practice. We never really trained Rags in agility in any formal way but we got the green light from Jackie who was running the event, so we figured, what the heck, let’s give a run at it. We play with jumps with her at the dog park sometimes, so maybe she could run an entire agility course. While her run was what I would have expected, it showed promise and potential and more importantly, Rags acted very well at the trial and proved to us that we could take her with us as we compete with Scraps. 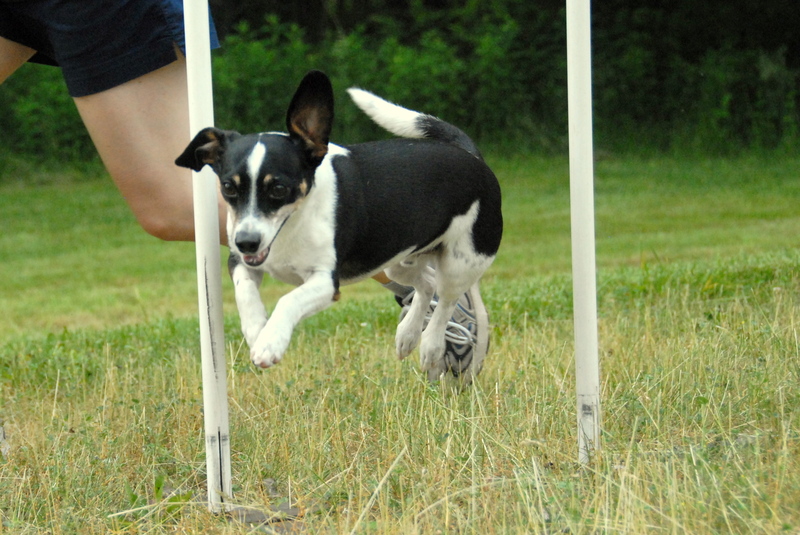 Below is a video of Rags’ debut on the agility field, even though it was just a fun run. By the way, thanks to Jackie and Linda for volunteering their time to putting this event together. 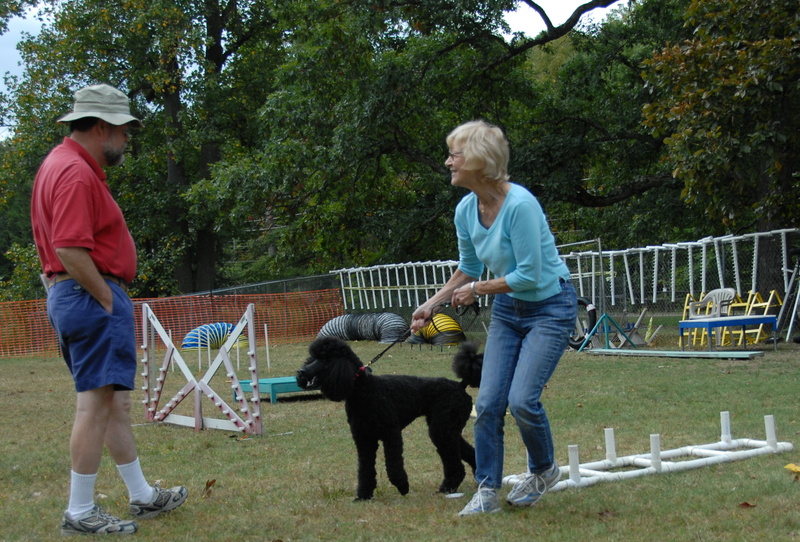 I’m sure it raised some good money for St. Huberts and it gave lots of people and dogs a flavor of competing in agility. A very worthwhile experience.